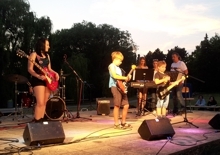 The rock bands of the Schools of Music Favoriten and Hansson-Zentrum will perform rock and pop songs in different ensembles, such as Crazy Little Thing Called Love by Queen or Seven Nation Army by the White Stripes, and others... thus proving the young artists' huge talent. The ensemble Odeon was founded at the School of Music of Favoriten. It was in 2010 that the ensemble fell in love with the ukulele's charm, and currently comprises seven members. This year, the ensemble is reinforced by two singers and presents a new program on stage which will trace an arc through all kinds of music styles. Her songs have found their way to the studio at last, and are finally published on the CD 'Statement No.1'. 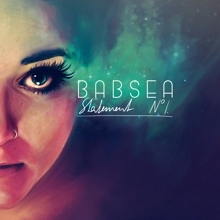 Playful melodies and highly expressive piano arrangements take Babsea's ideas straight to the point, and colorful nuances in her singing underline her composition style. Babsea's creative approach to the pop, singer/songwriter, as well as soul genre results in a perfectly balanced variability. With her gentle as well as powerful songs, she makes a vociferous contribution as singer and songwriter. The debut is supported by musicians Julia Radschiner, Uli Permanschlager, Peter Nadasdi, and Mike Seidl – the same band members who, together with the soloist, participated in the creation of the arrangement. The album presents a cross section of loud and quiet, calm and moving, joyous as well as deep moments. This debut marks the official start of a courageous and likable artist's career, a start which makes a powerful statement! Reggae Broadcast is an unusual liaison between Austrian retro-soul musician Mary Broadcast and reggae producer and musician Papa Jahmani from Finland. Both musicians' reggae music is influenced by the 1960s ska, soul, rock steady, as well as the dub style of the 70s and 80s. The project was initiated in 2013 when the two recorded 'Pride and Joy', a piece already published on single vinyl in 2014. This song was also published in 2014 as Lee Scratch Perry Remix. In 2015, the duo returned to the studio in Helsinki and this time, recorded an entire record. It is planned to be released in summer 2016. The project received great attention despite having been performed only a few times in Finland and Austria, and was an instant worldwide success. Yoga means oneness. The practice of yoga allows us to unify body, spirit, and soul. On this weekend, I would like to give you a glimpse at the two essential areas of traditional and modern yoga and give you an opportunity to experience yourself the soothing and clarifying effect of yoga on everyday life. We will practice asanas which are suited for beginners as well as more advanced learners. I'm looking forward to your numerous appearance and practicing yoga as a group in the park, right in the middle of nature! 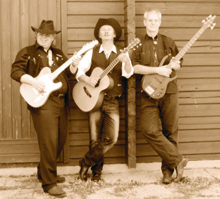 If it's country atmosphere with real country feeling, camp fire romance, lonesome cowboys and authentic country songs you're looking for, the Westmountain Boys are just your thing! An authentic country band, with a sound like Johnny Cash in his first records. Unfortunately canceled due to bad weather. Probably the most charismatic band north of the South Pole! An explosion of funk, soul, and disco hits – of a long past, but never forgotten time. Seven for Tea – this name hits the nail on the head: seven funkoholics light a musical fireworks with grooving beats, piercing wind players, and a powerful-voiced front woman.